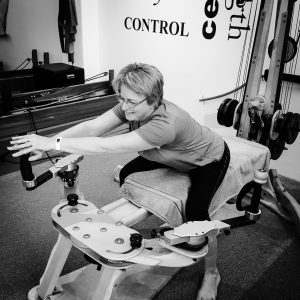 I was excited to get a recent unsolicited endorsement of GYROTONIC® from one of our clients. Mfanwy was so excited by her progress that she agreed to edit it into a blog format so we can get the word out about how wonderful this ‘miracle’ really is. Thank you, M. You are the perfect example of the power of this work and why I chose to learn it over 20 years ago. Ever wondered what that strange machine is that sits in the front corner of the studio? That is the best machine for you if you’re stiff, feel like you need to stretch your whole body and move more freely. Being diagnosed over a year ago with fibromyalgia (pain, high fatigue, very stiff muscles and joints), I turned to Neil and the Pilates Method to help me get my life back. Over the past year, I have improved and anticipated I would continue to get better. To my surprise a few weeks ago, for no apparent reason, I had a flare up of symptoms and my body was getting stiffer and sorer each day. Not knowing how to regain my movement and reduce my pain, Neil suggested using GYROTONICS® and it’s specialised equipment, the Pulley Tower/Handle Unit. After one session, I had improved movement, less stiffness and decreased pain. I also had a level of energy I had not had for several weeks. The improvement continued each day after the session. Now, Neil cannot stop me wanting to have a play with the ‘miracle machine’. Each session the gentle stretches and movement allowed my body to regain flexibility, movement, reduce pain and energy. After just three sessions I’m now back on course and a convert to GYROTONIC®. Mount Hawthorn is very privileged having Neil and his team, who are exceptionally skilled and empathetic, in assisting people like me to reclaim their back after illness or accidents. Contact the studio or your instructor to learn more about GYROTONIC® or to book your first sessions. We also teach the floor-based version called GYROKINESIS® on Monday eve’s and Saturday mornings.